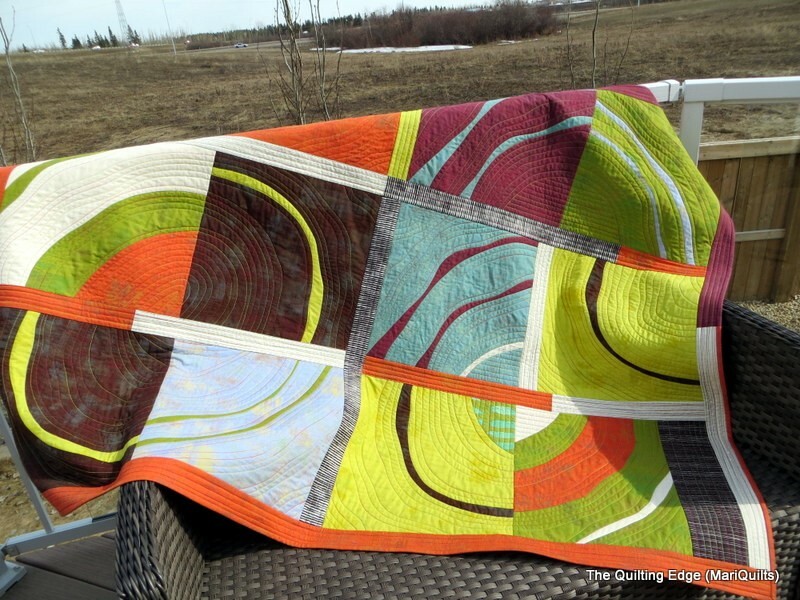 The Wonky Curved Piecing Workshop is based on my quilt, Ripple Effect II. Each block is created using a freehand style of curved piecing. The blocks are quilted individually and then joined together later, using joining strips. Workshop hours: 8:30 am to 4:30 pm. Participants can start setting up at 8:00, and we need to clean up and be out of the room by 5:00 pm. Lunch: There will be a half hour break - bring a bagged lunch with you, and water or snacks if you like to sustain you for a full day of sewing! Cost: $70 for MQG Victoria members, $75 for non-members. Feel free to use prints for the backs as the Quilt as You Go technique basically gives you a reversible quilt. It’s my personal preference is to have all the colours front and back work together. A few similar colours in different values work well giving you subtle shading effect. Adding some contrasting values gives your design some definition. One colour per block….a minimum of four colours and maximum of twelve depending on the amount of blocks to be constructed. Note: prints may be used but I have found using too many prints or too bold of prints results in very busy blocks. The blocks are large and have a fairly strong, visual impact. Each block requires two fat quarters, one for the front and one for the back of the block. Approximately a meter of coordinating fabric for binding and joining strips…..again depending on the desired size of the project. I prefer to work with full width yardage rather than fat quarters because I like to I design as I go. In other words, I’m not sure ahead of time which colours and fabrics I will be using for joining the blocks. By using yardage rather than fat quarters I have a few more choices. Another alternative is .75 meters fabric per block…this would include enough fabric for the front and back of each block and give you some variety for the joining strips and binding. This is really my method of choice. The total amount of fabric would depend on how many blocks you are making to obtain the desired size of the finished project. Each finished block will measure approximately 17 inches….remember this is just an approximate measurement. For example if you wanted to make twelve blocks as you would need approximately 12 half meters of fabric or 24 fat quarters. The amount of batting necessary depends on the amount of blocks required to finish your desired project. If your finished project has 12 finished blocks measuring 17” each you would need 12 squares of batting at approximately 19” square. Plus a little extra for inside the wide joining strips.